Highway 3 was blocked today where it enters Brocket from the west by a peaceful but determined protest held by Piikani Nation members protesting federal Omnibus Bill C-45. The blockade began at about 9:30 am and continued until noon. Traffic was backed up for a long way in both directions, but a single lane was allowed to flow periodically, in part it seems to let emergency vehicles through. At other times a round dance was held in the middle of the highway. The blockade ended with a march back to the Piikani/Brocket townsite, led by local drummers with many vehicles full of supporters bringing up the rear. "It's really horrible how they're just chipping away at our rights," one Piikani Nation protester told me as we stood on the highway in frigid -14 weather, made colder by a brisk wind. 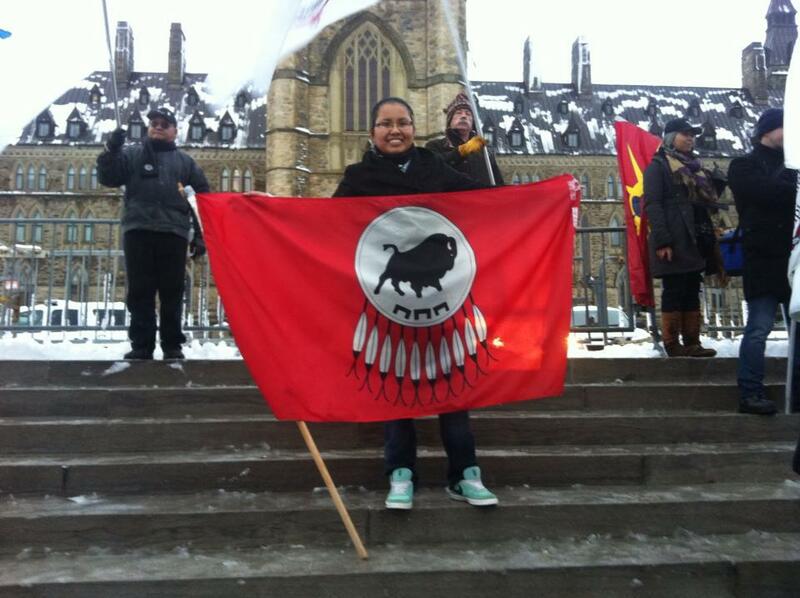 ^ Bailey Bastien flies the Piikani flag in front of the House of Commons this morning. 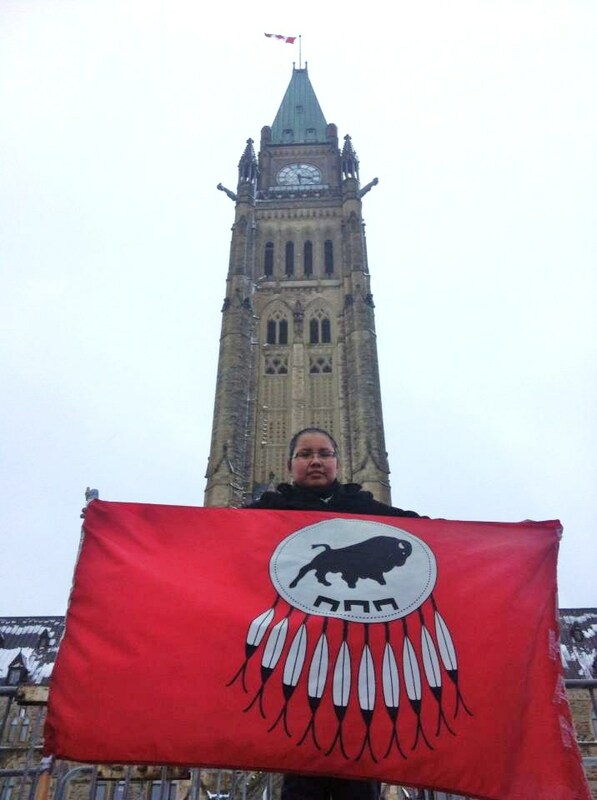 Bastien travelled to Ottawa with the Standoff 'Idle No More' group. "It effects not only First Nations Treaties but all citizens of the world. It effects Mother Earth and the land that our future generations will walk upon," said Jamie Medicine Crane in one social media posting. "Many of our ancestors have gone before us and helped paved the way so that we will all stand in Unity to make our voices LOUD! Many drums, songs, peace pipes, and prayers are being said today not only you but for everyone!" "Idle No More" has become the rallying cry of First Nations flash mobs that have been organised all over Canada and globally using social media and word of mouth. The protests have been in part inspired by the ongoing hunger strike of Attawapiskat Chief Theresa Spence, now in its tenth day. Critics charge that Bill C-45 weakens Canada’s environmental protection laws and unfairly changes land rights granted in the present Indian Act of 1951, which has roots in the Constitution Act of 1867. Idle No More rallies and demonstrations have been reported in Edmonton, Regina, Prince Albert, Montreal, Parliament Hill in Ottawa, across the United States, the United Kingdom, Egypt, the Ukraine, Winnipeg, Saskatoon, London (Ontario), London (England), Fort McMurray, and many other places. Regionally, another flash mob is planned for Park Place Mall in Lethbridge this afternoon. 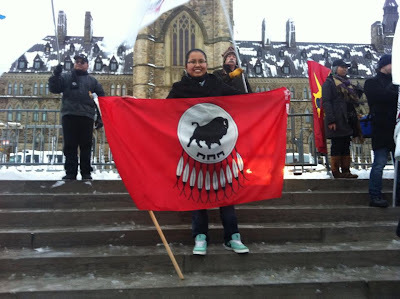 According to a press release issued by Idle No More on Monday, December 17, the organization began with four women, Nina Wilson, Sheelah Mclean, Sylvia McAdam and Jessica Gordon, "sharing a vision of bringing together all people to ensure we create ways of protecting Mother Earth, her lands, waters and people. The women began discussing the possible impacts that some of the legislation would carry if people do not do something. It became very evident that the women MUST do something about the colonial, unilateral and paternalistic legislation being pushed through the Government of Canada’s parliamentary system. They began with a piece of legislation called Bill C-45 which attacked the land base reserved for Indigenous people." At the heart of their argument is their belief that First Nations are indeed sovereign nations and should be treated as such by federal and provincial governments "The Treaties are nation to nation agreements between Canada and First Nations who are sovereign nations," is a cornerstone contention reiterated in the press release. "The Treaties are agreements that cannot be altered or broken by one side of the two Nations." Another key contention is that the government's intent is to break up reserve lands for profit. "Currently, this government is trying to pass many laws so that reserve lands can also be bought and sold by big companies to get profit from resources." The protection of natural habitats is also threatened, according to another statement issued jointly by the Idle No More movement and a cornucopia of First Nations rights groups and environmental grassroots organizations. "Bill C-45 would further undermine the protection of Canadian nature by making substantial changes to the Navigable Waters Protection Act (NWPA, proposed to be the Navigation Protection Act), the Fisheries Act and the Hazardous Materials Information Review Act — critical laws that were once used to steward a sustainable environment, clean water and healthy oceans for all Canadians." "Together, the changes proposed in the omnibus bill would further weaken Canada’s environmental laws, remove critical federal safeguards, and reduce opportunities for the public to have their say about projects that could threaten the air, water, soil and ecosystems on which all Canadians, and our economy, depend." During the Piikani protest organizers averred that many of Canada's highways would be blocked by similar protests if Bill C-45 is passed. Power to our Native brothers and sisters who are standing up to HarperCON tyranny and leading the way for all peoples in this great land to free ourselves from the iron grip of corporatocracy and their insatiable and unconscionable GREED. "The Earthly Mother and I are one." It is nice to see People Power in action it is something rarely seen in Canada but more is needed if we want to hold all levels of governments accountable to us the people. When words fail actions prevail. May I suggest to seeing people at the rally`s ALL thru~out Canada or in Ottawa,To Dress up in our full Traditional Outfits! !I am from the Peigan Nation. And I believe that our Lands, Rights, and our traditions should be protected! for All our children`s Future!!! this is a great injustice to all my people!